CHARLOTTE, N.C., September 21, 2017 /3BL Media/ -- As part of its continued commitment to building a smarter energy future, Duke Energy today announced plans to install North Carolina's two largest battery energy storage systems – a $30 million investment as part of the company's Western Carolinas Modernization Plan. For many months, Duke Energy has been working on future energy needs in the region with stakeholders, including members of the Energy Innovation Task Force (EITF). The EITF is an ongoing collaborative effort with the city of Asheville and Buncombe County. One focus area of the group has been to take advantage of emerging technologies like energy storage to better serve the region. "Duke Energy has experience with many battery storage projects around the nation," said Robert Sipes, vice president of Western Carolinas Modernization for Duke Energy. "Western North Carolina is an ideal spot to use this technology to serve remote areas, or where extra resources are needed to help the existing energy infrastructure." The two sites identified are the first of a larger plan Duke Energy has to deploy energy storage for the region. The two projects are viewed as positive solutions by local stakeholders due to their relatively small footprint, making little noise and producing no emissions to the environment. In the city of Asheville, a 9-megawatt lithium-ion battery system will be placed at a Duke Energy substation in the Rock Hill community – near Sweeten Creek Road. The battery will primarily be used to help the electric system operate more efficiently. It will provide energy support to the electric system, including frequency regulation and other grid support services. In Madison County in the town of Hot Springs, the company is planning a 4-megawatt lithium-ion battery system that will help improve electric reliability for the town, along with providing services to the overall electric system. The company is also considering a solar facility in the town to work in conjunction with the battery system. Duke Energy's Western Carolinas Modernization Plan aims to meet the region's power demand by balancing public input, environmental impacts and the need to provide customers with safe, reliable and affordable energy. The plan included a commitment from Duke Energy to deploy at least 5 megawatts of energy storage for the region. But the company is planning more. "These initial utility-scale energy storage projects represent an integral first step in upgrading and modernizing our grid infrastructure," said EITF Technology Working Group co-chair Ned Ryan Doyle. 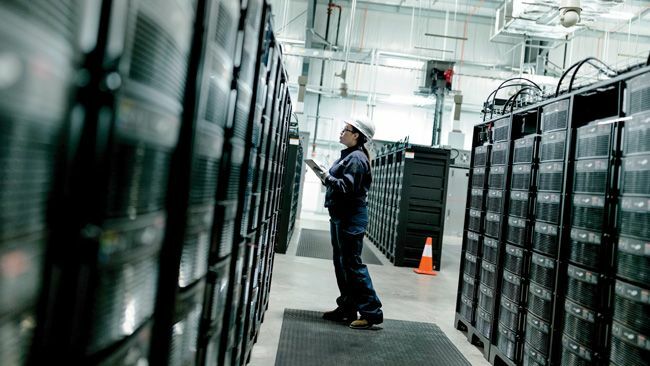 "Investments in energy storage are a key component to a more reliable and resilient grid. It provides a foundation for the expansion of true clean energy sources." Further details on the projects will be filed with the North Carolina Utilities Commission in early 2018. Both projects are expected to be online in 2019. Duke Energy has a smaller battery installation in the region. In Haywood County, the company has a 95-kilowatt-hour zinc-air battery and 10-kilowatt solar installation serving a communications tower on Mount Sterling in the Smoky Mountains National Park. The project went online earlier this year. A previously announced part of the Western Carolinas Modernization Plan involves Duke Energy closing a half-century-old, coal-fired power plant in Asheville in 2019 – and replacing it with a cleaner, natural gas-fired power plant, consisting of two generating units.